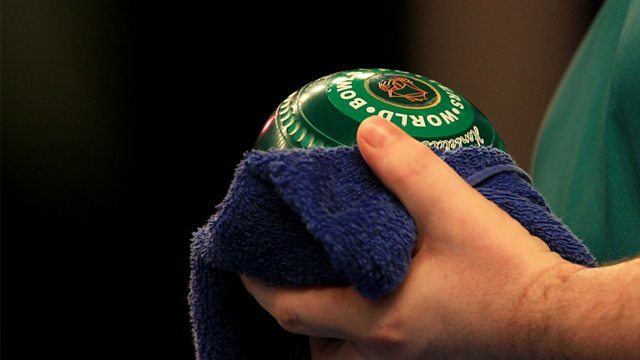 Highlights from both semi-finals in the singles at the World Indoor Bowls Championships in Norfolk. Presented by Rishi Persad with commentary by David Corkill. Browse content similar to Day 6. Check below for episodes and series from the same categories and more! really. It hasn't been as accurate as he has in the previous games. Paul knew that was a little bit heavy. He was trying to hold back. length. He likes this Well, shot back... Second delivery. be reaching. . Yeah, that's the problem. Don't think he is. One red. previous games. You give this man room, he's going to take advantage. like two. Could get this third bowl in here. he had to be there. Sort of forced him to make sure he was reaching. Very close in the second. Well, that certainly indicates two. away from the head. He knows he certainly has got one, possibly two. backhand, he could play it on either side. He's got to be positive here. singles and a double. Still playing good bowls, Les, still dangerous. it. Well, Paul Foster is lying game. So Les needs to do something here. Encouragement for this one. That's a great ball, this. Well played, Les. could be a bad result for you. Good try. That's a close, close one. Mmm. That's a difficult one to call. No-one is giving us a clue. We're going to have to guess here. there, production team, and they're all saying who is lining the shot? of pressure in the seconds set and he's digging deep to be still in it. form. I think this would be the full length. Full length, good opener. Make it's an interesting end. Just taking his time. Getting set. Needs a good one. Game rattling through at a decent pace, just over an hour and a half. you are. You're facing a big problem with your final delivery, Les. a two. The third bowl has let him down. pushes that bowl in. Les has 3 seconds, Paul mystified by that one. awful lot of entertainment for everyone. Is it... It looks under. fantastic week, but Paul Foster deservedly won the game. Congratulations then to Paul Foster. Through to the final once again. the second. He is 6-3 ahead as we join the action in the sixth end. off, and you end up 5 feet short. Greg has put his under pressure. place. So Greg just asking for things to settle. Stop the clock. trying to add number 3 here. Two good shots. Yep. Important bowl. movement. So crowd react to that. They want to see a tie-break. his out. Very experienced. Oh, there's clear. 3 shots, Greg Harlow. Well, 3 shots, Greg Harlow. Push the red bowl up. No problem in the end. Nope. Normal service resumed. But Stewart would be slightly concerned. find the weight. I don't think it was the line. Just the weight. Doesn't play many loose ends like that one. difficult this match has been in terms of scoring multiples. , well it's a run for home now in the last 3 ends for these players. Close to this one. Very good. Picks the jack up. Just diving away a bit. Still needs to run to this one. I think he's just under for weight. for Stewart. Greg needs another bowl in. going out on the forehand. That could keep Stewart on the backhand. another bowl in here. Two seconds against. stage, one shot, he now has to win the last two ends. Yeah, he has. Harlow will be looking to... Well, Greg, tactically, quite clever here. previously. So good tactics. Trying to get in first. shy of the jack. The correction comes in now from Greg. He's a local man. He lives close by, works here. backhand draw for Greg. Only one down. to turn. The best you can do here is two. There's no point in playing it. last ball. Quite simply, Stewart Anderson scores, he's in the final. Greg scores, it's a tie-break. So exciting end coming up. slightly under, is he? Nope. He's very close. He's got it perfectly. Perfect, the bowl. What a great shot. That really is just in front. of shot here. Quite simply, red ball, plantses out the green bowl. difficult. He was under the hair. That's why he got a bad result. Stewart Anderson can draw that bowl out. Trying to put a better shot in. to flick it off. Try to draw this, really. Think I'd try to draw it. seen him play. Shows you he doesn't like the forehand now. leave a shoulder on the backhand, that's the danger if he plays it. a feeling that Greg will attack it with the next one. That's a bit pacy. Well, that's so far away, that was quite deliberate. leaves gaps. He doesn't want to put the two bowls together. positions, just looking at it. Well, knew his ball was a foot away. really. It was a bit of a nerve your one. You can't blame them for that. other events, it's only 3 matches involved. That's slightly different. the shot ball, 3 inches. Still the backhand draw for Stewart. draw the shot? It's hard! The backhand is the hand he's favouring. not short. Oh, that's a long way heavy from where it's looking for. favours green. It's sitting down. A measure to get into the world final. Harlow survives. What did I say at the start, Andy? You did! Good call. possible way. That bowl from Stewart Anderson should've been the shot. ends were tens, this is really going to test both the players. time. Relaxing that arm. Nice relaxed. To push through the bowl. it's heavy, he can catch the bowl or catch the jack. Just on the bend in. outside ones, it's all sorts of chances there the alternative, Andy. he'll play a forehand runner, basically hoping his luck is in. a big bowl to pray to try and get to the world final. the moment? At the time, you can't afford to think about it too much. now, from all of us, bye-bye.